Host Milan was an enormous show, of 18 Halls, exhibitors and a lot to see. Unfortunately nothing stands out as a ‘new’ product to tell you about, but many developments in technology which we will be following up. o The spheres float on the surface of liquid in open tank and thereby greatly reduce the exposed liquid surface area – up to 90%. o Dramatically diminish objectionable fumes and odours. o A blanket of spheres also insulates heated liquid reducing evaporation and heat requirements. 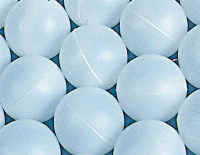 o Spheres are hollow and will float on any liquid. Being smooth they ensure a much tighter surface cover. o Polypropylene, non-toxic and able to withstand continuous working temperatures of 110° C (230°F). 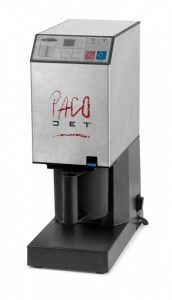 RELY Services are the exclusive importer of Pacojet in Australia. RELY provide back up and support Australia wide for Pacojet. We have a service department managed by Frank Strangio . Annual service of the Pacojet is strongly recommended to keep the unit in good working order for a long life (just as one would service a car!). Customers are contacted when annual service is due and Frank travels most of Australia at least once a year to undertake servicing. Over 50 canisters / week – biannual service is important. Special available until 19.12.2011 or while stocks last. POP UP EVENTS are becoming a regular feature in many calendars and equipment for these is now available for HIRE from RELY. We have Irinox 5 tray blast chillers, Pacojets, Sous Vide equipment – circulators and vacuum machines, and the smaller items, espuma guns, superbags and smoking guns. Everything is available for daily or weekly hire. Contact RELY for further information – office@relyservices.com.au.